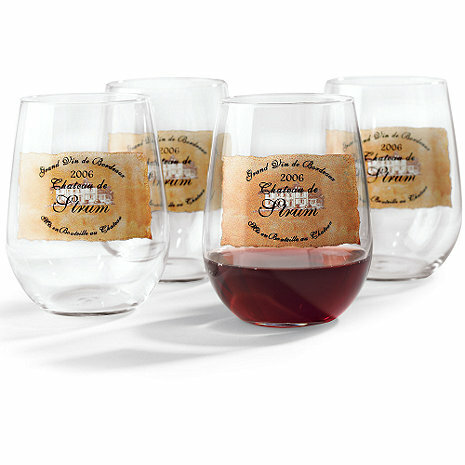 All-purpose stemless wine glasses, makes a great gift for the holiday season or any time of year. Fired on colors are brilliant. Customized to display any name up to 12 letters. Makes a great gift for this holiday season or any time of year. Sold as set of 4. Machine made leaded glass. Recommend to hand wash. NOTE: Name and Year can be personalized. If year is not specified, personalization will default to current year. Neither image nor pre-printed text can be changed or removed. Can I get the stemmed wine glasses with the Chateau de _______? BEST ANSWER: Thank you for your question, on the Estate Wine Glasses they are only offered in the stemless version. We do carry other personalized stem type glassware under the Personalized tab on the web site. I bought these for my friend last year...and, a year later I bought 4 more for them for Christmas this year. She uses them daily. We compared last year's to the new ones, and you cannot tell the difference! That is a true test to the quality of these glasses, as well as the quality of the personalization. She washes them in the diswasher too! I would highly recommend these, and will probably buy more next year! I have bought these personalized glasses quite a few times for bridal shower gifts. They are always well received and appreciated as well. Very cool. And from a quality standpoint not overpriced. I would have given it five stars if each glass had a different theme along with the name you wanted to put on there. In other words, like the logo of different vineyards around.